Twenty homeless people were turned away from warming shelters Tuesday night. Organizers say one shelter didn't open due to a volunteer shortage and say they need more help. If Kathleen Thorpe wasn’t volunteering at a warming shelter in Salem, she said she’d be at home watching television. But if she did that, Charles Dobson might have spent a recent night and early morning in the freezing cold. “When they don’t have enough volunteers… then they pretty much turn us away,” said Dobson, a homeless 20-year-old. Thorpe and Dobson were among the numerous people cloistered in the basement of First Presbyterian Church on Tuesday night. She was among a dozen orange-vested volunteers and he was one of about 80 homeless who found a blue mat to curl up on for the night. Volunteers are in high demand, according to the Mid-Willamette Valley Community Action Agency, as Salem endures the longest cold snap of the season. Weather for six out of the next seven days are forecast to be at or below freezing, according to the National Weather Service. 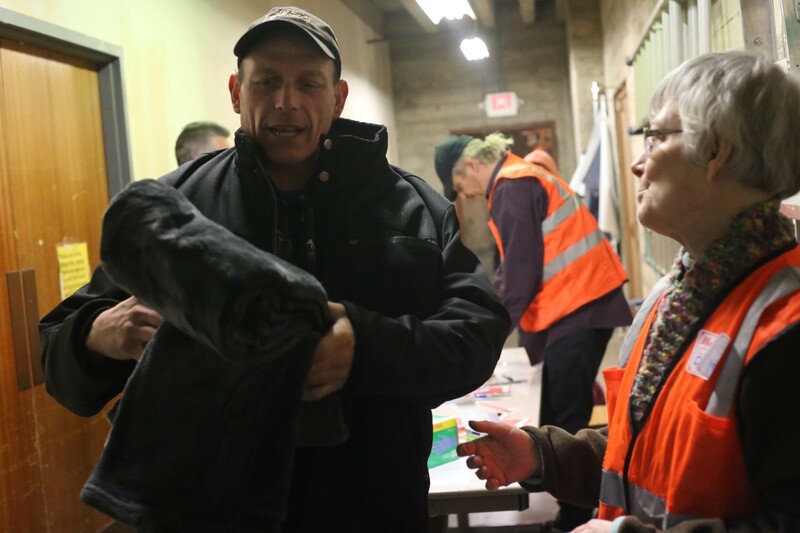 The cold spell is not only a danger to homeless but it also wears down volunteers. “They’re tired. They can’t catch up on sleep and they’re just not able to show up and stay through the whole shift,” said KayLynn Gesner, outreach coordinator for the agency. As a result, a handful of volunteers called in sick Tuesday night. One shelter closed. Twenty homeless people were turned away. There are three shelters that come online when temperatures drop below freezing: First Presbyterian Church, at 770 Chemeketa St. N.E. ; Salem Friends Church, at 1140 Baxter Road S.E. ; and Church at the Park, at 2410 Turner Road S.E. Salem Friends Church didn’t open Tuesday night because there weren’t enough volunteers. About 57 volunteers are needed total to staff all three shelters, Gesner said. Combined they offer about 190 beds. Gesner said there are about 125 volunteers who have volunteered at least once this season, but the organization would like a roster of about 250 to 300 people to ensure shelters don’t close. She said a positive attitude and patience are the most important qualities. 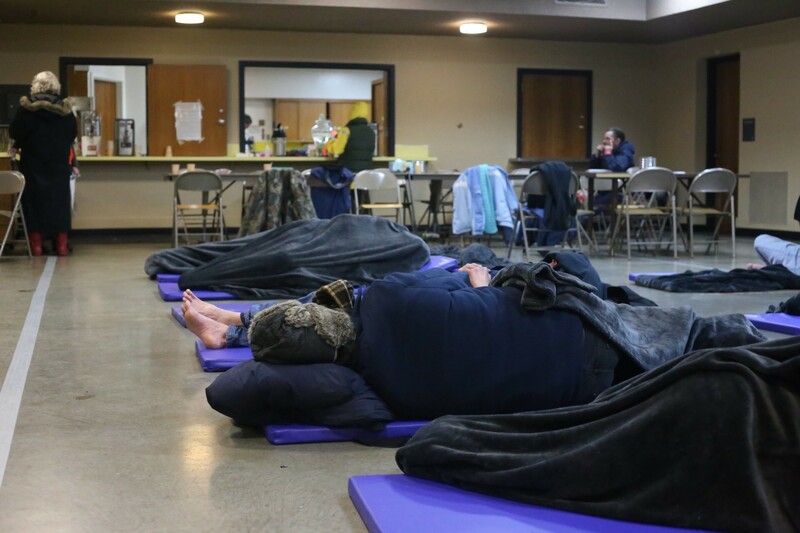 Shelters open 7 p.m. to 7 a.m. and volunteers can generally choose one of three shifts: 6:30 to 11 p.m., 10:30 to 3:30 a.m., or 3 a.m. to 7:30 a.m. Gesner said it’s hardest to find people to work the early mornings. Gesner noted that warming shelters, which run from Nov. 1 to March 31, are more active this season. Shelters opened 24 nights so far this season, compared with seven last year. Last season, temperatures had to notch 27 degrees or below for three straight nights to activate shelters. This year shelters open any night temperatures are forecast at or below 32 degrees. Dobson, the 20-year-old, said he was glad for the mat at First Presbyterian. “Some nights it just gets really cold and you can’t stay warm enough,” he said. He said he thought most homeless in the area didn’t have well-insulated sleeping bags to thwart the freezing temperatures. Another homeless man, Willie Styles, said he first went to Salem Friends Church only to find it was closed. “I was worried. I came down here right away,” Styles said when he arrived at First Presbyterian shortly after 7 p.m. Volunteers Tuesday night spent the evening situating their guests. They helped sock away personal belongings in garbage bags and in backroom storage areas. They served warm drinks near the kitchen. Many said it was fulfilling. “It’s needed,” said Thorpe, who said she decided to volunteer one day when she stood in her home on an 18-degree day and realized how warm she was. She decided to help at the warming shelters. “It’s a gift. It’s a good thing to do,” she said. Lynelle Wilcox, another volunteer, said she understood not everyone can make time to volunteer but she hoped others realized it was a chance to help.